Electronic stopping describes the transfer of kinetic energy from highly energetic ions to electrons in matter. This process results in massive electronic excitations within the target material through interactions with the charged projectile’s electric field. The researchers will use first-principles simulations to address a few outstanding challenges in modeling and theories of electronic stopping as well as to answer outstanding scientific questions in how DNA responds to ionizing radiations. Although significant progress has been made for modeling electronic stopping in solids, we as a community still lack understanding for how the electrons of projectile ions are involved in electronic stopping especially for heavy projectile ions. Building on our prior INCITE work, the new simulation method can be also used to model electronic stopping of large complex systems like DNA. In particular, a molecular-level understanding of electronic stopping process as it occurs in liquid water and solvated DNA under ion irradiation is developed in the context of ion beam cancer therapy. The researchers will use this award (1) to further advance modeling of electronic stopping and to study hot-electron initiated ion dynamics for swift heavy ion projectiles in solids, and (2) to use their predictive framework to investigate the intricate details of electronic excitation dynamics of solvated DNA under ion radiation (as compared to electronic excitations under typical photon irradiation used for radiation oncology). 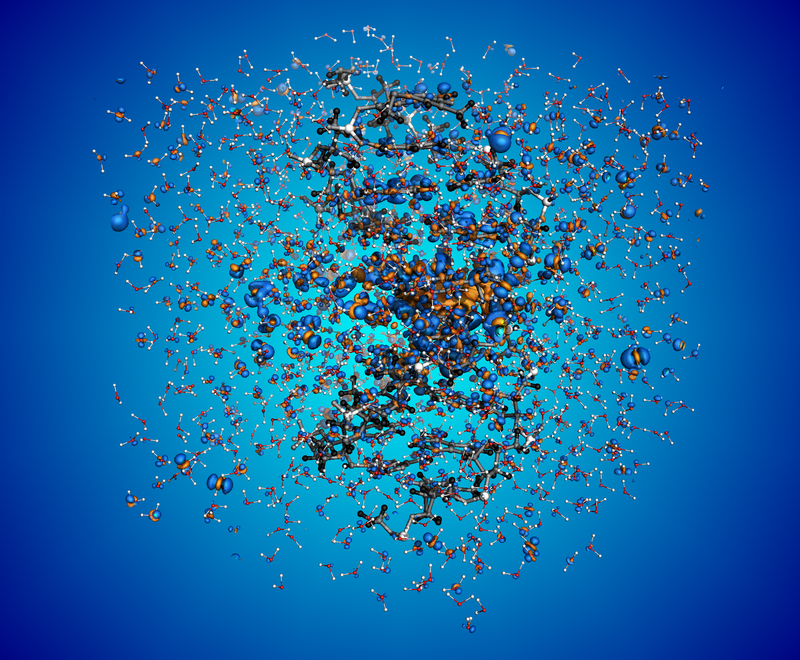 Their highly scalable implementation of real-time time-dependent density functional theory code has been further optimized, putting the team in a good position to execute highly complex, massively parallel simulations.